We are a Bujinkan Buyu Dojo affiliated with Jack Hoban, and emphasize the training method of Masaaki Hatsumi, including interpretation of classical waza for contemporary situations. The International Bujinkan Dojo is based in Noda City, Japan, and is directed by the 34th Grandmaster Masaaki Hatsumi. 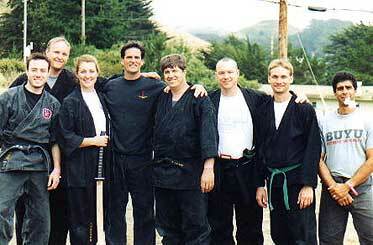 The Bujinkan Dojo ("Divine Warrior House") transmits the teachings of nine ancient warrior schools. These traditions include both Samurai and Ninja schools. Budo-Taijutsu focuses on self-defense and the defense of others through the utilization of a realistic training method. People who are looking for a competitive, aggressive atmosphere will probably be disappointed and quit. Make no mistake, however, the training is realistic, challenging, and quite physical in nature. Our primary focus for students is the development of a well-rounded repertoire of self-defense and defense of others, coupled with a respect for self and other people. Through training, students learn personal security, discipline and a code of life-long values. Our training encompasses many experience levels. 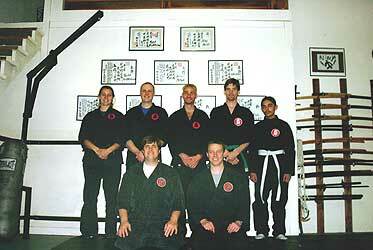 Participants from beginner to our most advanced black belts train together in a cooperative environment. We are pretty informal, and welcome all people, so come on in and check us out. Our training times are 7:30 to 9:30 on Tuesdays and Thursdays. See the map for directions. Please call our senior instructor, Jeff Morrison at 775-691-2992 for more information. You can also .